Smile! You're on Critter Cam! Who lives in the woods? This spring, Gateway Nature Preserve had the chance to find out, thanks to the North Carolina Candid Critters project. Using a trail camera provided by Candid Critters through the Forsyth County Public Library, we captured the movement of deer, raccoons, red foxes, squirrels, and groundhogs—and one spider! NC Candid Critters uses data collected by citizen scientists to map trends in animal populations across the state. It provides motion-activated trail cameras to individuals and groups interested in tracking wildlife. After a brief training, the participants follow standardized guidelines in setting up the cameras for three-week long "deployments." At the end of the three weeks, the data is loaded from the camera's sim card to eMammal, a program managed by the Smithsonian Conservation Biology Institute, and sent to the NC Candid Critter team at NC State University. In March, Gateway Nature Preserve volunteers placed the trail camera in the woods over the greenway, and in April set up a second deployment facing the meadow area south of Salem Creek. Each deployment resulted in more than 800 motion-activated photos, capturing color photos during the day and black-and-white at night. The amount of activity was partly luck in camera placement, partly following cues that suggested animal activity—for example, nibbled daylily leaves suggested the presence of wildlife. None of these species captured on camera was a big surprise. Visitors to the Preserve often see groundhogs and squirrels, with foxes and raccoons sighted more rarely. The nocturnal deer—a buck with 8 points, a young buck with prongs, and a doe—were a great find, though, especially since we saw them in both locations. While deer are sometimes spotted at the Gateway Nature Preserve at dawn, where they hide out during the day is a mystery. Do they follow Salem Creek to Salem Lake? Hide in a deeply wooded corner? This spring’s experiment only scratched the surface of what can be learned about wildlife in the Gateway Nature Preserve. Do the species vary by season? What habitat features do they use? What food sources attract them? What more can we learn? In addition to the “aw how cute” factor, the critter cam evidence underscores the level of wildlife activity that may go unnoticed but makes up the rich fabric of a habitat. From the shy deer hiding in the twilight, to beetles and worms that live under leaf mold and logs, to wildflowers blooming in remote corners and warblers perched in treetops, there is a rich multitude of species waiting to be discovered. Educators! Is your class interested in collecting and analyzing trail camera data at the Gateway Nature Preserve? We are planning fall deployments, and welcome your input for developing a research strategy! If you are interested, contact gatewaynaturecenter@gmail.com. Learn more about Candid Critters at www.nccandidcritters.org . Gateway Board Member Phyllis B. Smith helps visitors to the Gateway booth create bee rafts. Last month, environmentalists and families came together to celebrate Earth Day. Historically, this day has focused on raising awareness of humanity’s increasing impact on the environment. And every year the Piedmont Environmental Alliance puts on the Earth Day Fair to educate the families and residents of Winston-Salem. And like everyone else who cares about the planet we live on, the Gateway Nature Preserve joined the Fair, hosting its own education booth and kids’ activities. Since the Preserve is celebrating the Year of the Pollinator, our booth focused on encouraging Winston-Salem residents to create pollinator-friendly gardens and backyards. For the kids, we had two activities. The first was creating Bee Rafts. Like the name suggests, these are small rafts made from sticks and rubber bands to help bees float. Bees often find themselves drowning in bird baths as they are trying to grab a drink. Since the surfaces of many of these baths are often smooth, bees find themselves unable to get out and end up drowning. Bees rafts are an easy way to prevent this. This activity was slightly harder for younger children, but for older kids, this was a great way for them to feel like they were saving the bees. Kids had to take a rubber band, wrap it around each individual stick (they only needed three), and then tie the rubber band around the sticks together. It will float in standing water and let bees safely climb onto the raft where they fly away after drying off. The second activity was making seed bombs. We used seed from a hummingbird wildflower mix and compost to make the balls. If the kids didn’t mind getting their hands dirty, they grabbed a small handful of dirt and rolled it into a ball. Next, they poked a finger into the rolled ball to make a hole and put a few seeds inside. Then they closed the hole by rolling it again. Voila! A seed bomb! When the kids got home, they could toss the ball into their yards and have native wildflowers pop up later in the season! While one of our team members helped the kids with their projects, other Gateway members explained the Gateway Nature Preserve about our upcoming projects and five-year plan. We would encourage parents to join our emailing list to hear about all of our upcoming events. Here at the Gateway Nature Preserve, we aim at building a community. We want people to come to the preserve and enjoy the company of each other or the birds singing. We want people to love the Preserve as much as we do. At the Earth Day Fair, we had a chance of including others into our community. It was a blast playing in the mud with kids while talking with their parents, grandparents, youth church leaders, and . We hope that everyone who stopped by our booth had just as much fun we did. And we look forward to seeing you at our next Gateway Nature Preserve event. Pollinator Garden Preparation Is Underway! What is that plastic square held down by sandbags in the field near the Washington Park parking lot? No, it’s not an alien landing pad—it’s the first step in establishing a pollinator garden! We are “solarizing” the existing plants, mostly invasive grasses and forbs, to kill them without using herbicides. Solarization involves using heavy-duty plastic sheeting to trap heat and kill invasive weeds. It is a slower process than using herbicides but does not have the long-term impacts on insect and animal life that are documented with herbicide use. This is especially important in a floodplain near Salem Creek. Solarization is is most effective during the heat of high summer, but a few plants are already turning brown, so it’s beginning to work! The Gateway Nature Preserve has retained landscape architect Sprigg Parker for the garden design. Sprigg will focus on a layout and native plant groupings that are beautiful and functional, as well as providing a setting for humans to appreciate the butterflies, bees, and other insects and birds. We also want to inspire visitors to support pollinators in their own gardens. The pollinator garden project is made possible by a generous donation from Joshua and Julie Sutter of West Salem, with matching funds from Joshua’s employer, Lincoln Financial Group. Joshua was one of the original founders of the Gateway Environmental Initiative and was instrumental in negotiating the purchase of the Gateway site in 2014; we are very grateful for his and Julie’s continued commitment to our growth. A big thanks also to Ram Tool Construction Supply Company of Greensboro for donating the plastic sheeting and sand bags for the solarization project. Watch for updates on the layout and plant choices! Between the prolonged days of cold and rain, you might find yourself going a bit crazy if you’re cooped up in the house with bored kids. Here’s a simple craft idea to keep little hands busy until the warmth of spring finally arrives—and stays for more than a day or two! Pine cone feeders are an easy and affordable craft to attract local birds. Most of these materials can be found in your house or backyard. I had to go out and find some pine cones, but that wasn’t a problem. Just a quick walk on the greenway and voila! Step 1: Tie the string around the top of the pine cone. Cut 10-12 inches of string for each pine cone. Take one end and tie the string around the base on the pine cone, preferably underneath the first row of scales. This makes sure that the pine cone won’t fall to the ground. Also, this prevents you from trying to tie the string later and getting peanut butter everywhere. Step 2: Put peanut butter on the pine cone. Now here is where things can get a little messy. With the knife, slather peanut butter onto the pine cone. Make sure to get it into every nook and cranny you can. Step 3: Roll it in bird seed. Now I used a bowl for this, but you’ll want to use a plate, especially if you have a longer pine cone. Pour some seed onto the plate so that it covers the plate. Next, as carefully as you can, roll the pine cone in the bird seed until it is completely covered with seeds. Step 4: Hang it up! Now you have your very own pine cone bird feeder! Find a nice place to hang it up, preferably in a tree somewhere. Make sure it’s not to close to any of your windows. The last thing you want is for your kids to be looking out the window and have a bird accidentally fly into it. Enjoy your visitors, and let us know which birds you see snacking on your pine cone feeder at gatewaynaturecenter@gmail.com. Johanna Gross is a senior studying Creative Writing and Environmental Studies at Salem College. She has always had a deep love of words and the outdoors but has always wondered how to combine her two passions. Now she has. She is currently a writing intern at the Gateway Nature Preserve and is enjoying seeing the intersection of her favorite hobbies. Take A Child Outside Week is here! Every year, the NC Museum of Natural Sciences celebrates the last week in September as Take a Child Outside Week. Nature centers and museums across the state participate. This year, TACO Week is September 24–30. Here is a list of activities to enjoy outdoors—whether at the Gateway Nature Preserve or in your own backyard! And on October 1, come out for a nature photo safari and scavenger hunt! Jump or hop from log to log and see how far you can go around the log circle. Stand on a log stump and imagine you are an animal or a bird. What do you do? Collect twigs, pebbles, leaves, to build a house. Who might live in this house? Is it a bird? Is it a fairy? Is it a mouse? In a quiet spot, create a home where your “friend” could live. How many letter shapes can you find in branches, twigs, stones or other natural materials? Can you find every letter of the alphabet? Pick a natural space the size of your foot. Look very closely. Observe for a moment. What's living there? Look for animal and plant life and compare other spaces nearby. Record your exploration of the natural world. Take a look around you—what do you see? What do you hear? What interests you most? Using all your senses, write down your observations. Search for objects that have fallen to the ground—leaves, branches, nuts, bird feathers. What caused these things to fall? Can you pretend you are a leaf falling to the ground in a storm? Since the Gateway Environmental Initiative formed nearly 10 years ago, we have envisioned the Gateway Nature Preserve site used as a resource for educators. In spring 2017, we had the marvelous opportunity to work with three colleges and universities to develop unique learning experiences with a variety of outcomes—in one case, a dramatic outcome! In February, Louise Allen, a lecturer at Winston-Salem State University, brought her introductory biology classes to the Preserve in for a mini “bioblitz.” Breaking into groups that focused on plants, birds, and insects, the students used the taxonomic tools they had learned in the classroom to identify and classify their discoveries. WSSU students examine and classify objects they found at the Gateway Nature Preserve. Students in Linda Birdsong’s Environmental Sciences class at Salem College needed a community service project as a requirement for the course. Birdsong and the Gateway Nature Preserve education committee came up with the idea of students developing an activity for the Preserve’s April 22 Earth Day Fair booth. 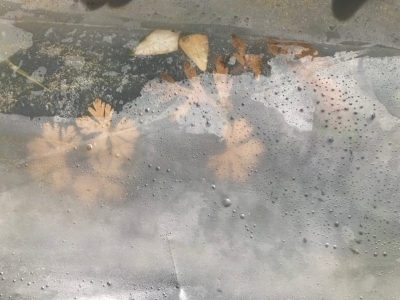 Five students chose to do a leaf pack experiment, a method of collecting macroinvertebrates for study and assessing a creek’s environmental health (leafpacknetwork.org). Macroinvertebrates are insect larvae, worms and crustaceans that live at least part of their life cycle in water. Certain species are an indicator of water quality. Linda Birdsong, flanked by two students, place leaf packs in Salem Creek. The students packed net bags with leaves, positioned them with stakes in Salem Creek, removed them the day before the fair, and helped our booth visitors find and identify the macroinvertebrates as they "unpacked" the leaf packs. The experience of designing an experiment, conducting research, and communicating their results to the public not only fulfilled a community service requirement, it supported their environmental sciences curriculum. For the Preserve, having students conduct a multi-phase project on site was invaluable and one we want to do again. Inspired by her walks in the Gateway Nature Preserve, Professor LeeAnna Lawrence at the University of North Carolina School of the Arts designed a course in which students would explore the deep role that a creek or a patch of woodland has in the formation of self, identity, community, and art. She named the course A Secret Landscape: Creek and Community, and her students—dancers, actors, filmmakers, musicians—immersed themselves in nature and environmental issues through readings from environmental writers such as Henry Thoreau and Wendell Berry, nature journaling, and weekly site visits. For their final projects, the students created performative spaces in the Preserve. One group wove a series of nests along the Salem Creek Greenway, for example, and another composed a video about the dangers of pollutants in Salem Creek. Another group enacted a dramatic mime about developing empathy for the environment, accompanied by a harpist perched high atop the creek bank. These three experiences demonstrate the infinite potential to extract learning experiences from a natural setting. We are grateful to the educators who encouraged their students to explore and grow at the Gateway Nature Preserve, and look forward to working with them—and other educators—again! This winter, the New Winston Museum invited Cornelia Barr to organize an Environmental Salon series that explores the interstices between nature, the environment, and history. The second event, on Feb. 23, brought together five amazing local writers who took early Moravian quotes about nature and the landscape, and “riffed on the similarities and differences between the Moravians’ appreciation of nature and the landscape and how we approach them today. Writer, playwright and poet Grace Ellis wrote a wonderfully evocative poem about how we value and treat wildlife, which she has graciously allowed us to publish here. “In the early years of his work, surveyor Philip Christian Gottlieb Reuter identified and inventoried resources in the Wachovia Tract and produced a description of the land, its flora and fauna (ca. 1760). His categories included "trees and shrubs, fruit trees, wild plants, cultivated plants and grain, fungi or mushrooms, stone, wild animals, wild fowl and birds, domestic animals and fowls, fish, snakes, insects and running and creeping vermin, flying vermin and insects." where human beings are concerned. or, as his Appalachian neighbors would say, “varmints”? on boats to reach our shores. would prove to be a threat to livestock. like Biblical plagues of locusts? What of copperheads, water moccasins, and rattlers? munching caterpillars, egg-laying moths, vine borers? that could strip the bean vines in a single night? a providential source of food for families? The problem is, of course—it’s complicated. is likely to have unintended consequences. Without bats--gnats and mosquitoes flourish. and rivers changed their course. since one man’s varmint is another’s marvel? Suppose the whole created world were surveyed. Thanks to all the writers who participated—Cyndi Briggs, Grace Ellis, Aimee Mepham, Edward Robson, and Ed Southern—for their thoughtful, funny, and engaging responses. And a big thanks to Martha and Mo Hartley of Old Salem Museum & Gardens for selecting the quotes and for all their support of the Gateway Nature Preserve. Landscape architect Christine Hilt of Cary, North Carolina, clearly understands the potential of the Gateway Nature Preserve. Christine’s firm, CLH Design, is developing a master plan for the Gateway Nature Preserve that will guide future development and enhancement of the site. The firm’s enthusiasm, focus on environmental education, and experience with habitat restoration made CLH Design a natural choice. Fortunately, The Winston-Salem Foundation agrees. In September, the Foundation awarded Gateway Nature Preserve a grant of $24,400 to cover most of the cost of the master plan process. Calling the site a preserve has profound implications for how the site will be developed. While it is far from pristine wilderness, the emphasis will be on habitat. Ultimately, the Gateway Nature Preserve will be a place where people engage with nature in an urban setting. The master plan will provide a roadmap for this process, identifying projects, prioritizing what needs to be done first, and attaching estimates to projects that will help with fundraising. Want to get involved? Find out how!